As a little girl, I always liked to collect things that interested me. It started with Hello Kitty and stickers, hockey cards and sports memorabilia. As I got older, my collecting matured to collecting things in the housewares department that involved cupcakes and desserts such as dishes, paintings, ice cream bowls, napkins, dish towels….you get my point, yes? Over the weekend I discovered a collection I didn’t even know I had. Ever go to open up a cabinet, drawer, old handbag or, like my encounter this weekend, an old makeup case and discover a secretly stashed collection? I discovered SEVEN different UNUSED lip balms inside of one makeup bag stuffed away in the bathroom cabinet. While this finding is exciting, I must say that I am still using and quite satisfied using the terrific lip balms I received in the Swag Bag from the Fitness Magazine Meet and Tweet back in May. I love the set of 4 lip balms from S.W. Basics. 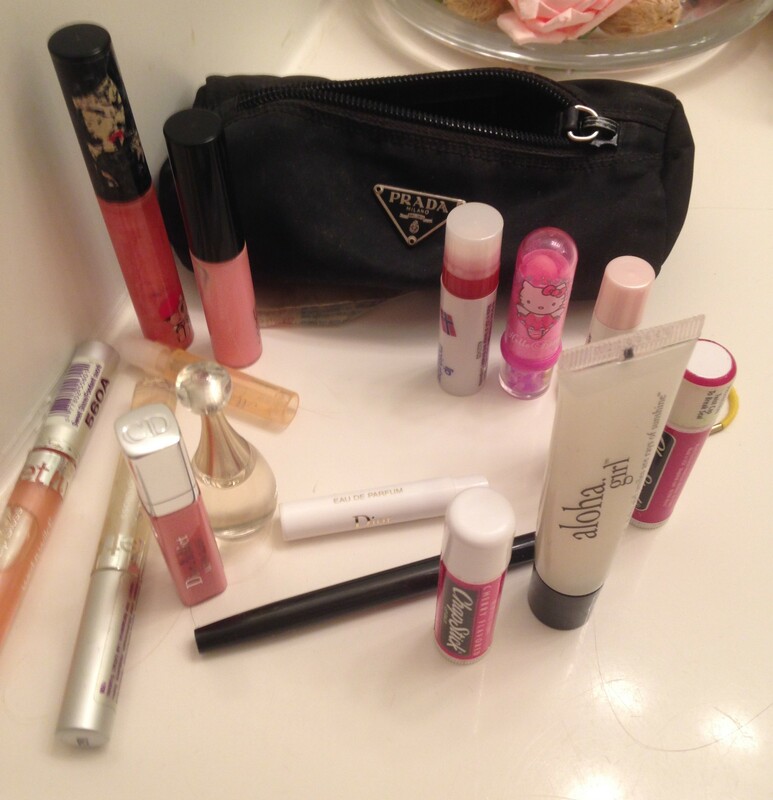 I try to keep track of where I place each one, which isn’t easy, but it seems there is always one in a pocketbook, makeup case or in the bathroom cabinet. I love each flavor, especially the Cocoa. They are super moisturizing with only a small list of natural ingredients. Anyway, I am glad to have this chapstick collection because it is suddenly quite chilly here and my lips, in addition to the rest of me, are going through an adjustment period. 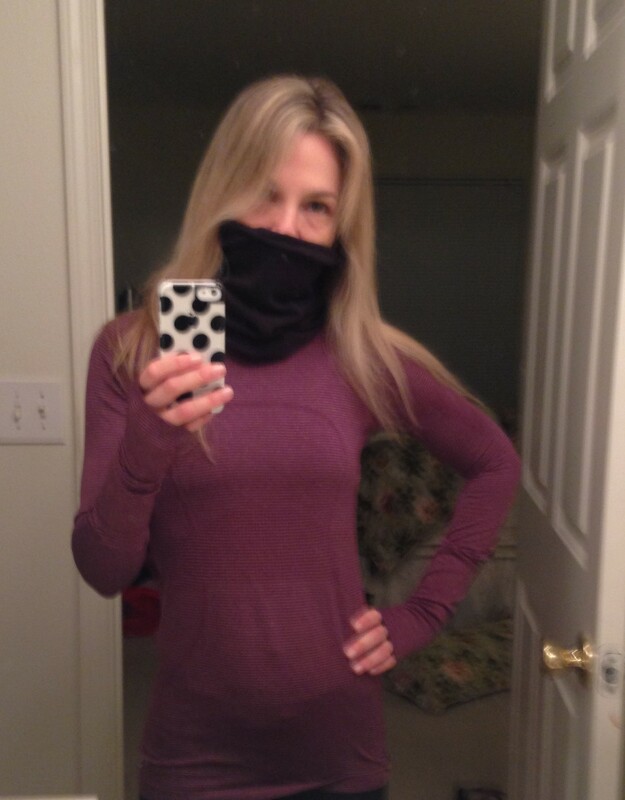 Friday morning’s run brought out the Lulu Lemon Brisk Run Neck Warmer that I use but don’t love. It is great because it pulls up and covers your neck and mouth until you adjust to the elements but it is not so great because it doesn’t stay up all that well. I ran a decent 5 1/2 miles Friday morning followed by a totally fabulous 12.1 miles Saturday morning. I am not sure exactly why I stopped at 12.1 rather than just completing one more mile to be able to tell you I ran a half marathon. Wait, I do know why – As great as I felt, sometimes I like to end my runs on a high note, stopping with a bit more to give rather than pushing myself too far. I know I could have finished out another mile but for what? I didn’t have a goal for Saturday’s run beyond the usual 10 miles. I always set out for a minimum of 10 miles and then make the decision if I will stop at 10, continue to 11, keep going to 12, and, if I have time and energy, perhaps up to 13 or 14. But I stopped at 12, feeling great, hungry and ready to begin the day. As they say, it is better to stop knowing you had 10% more to give. 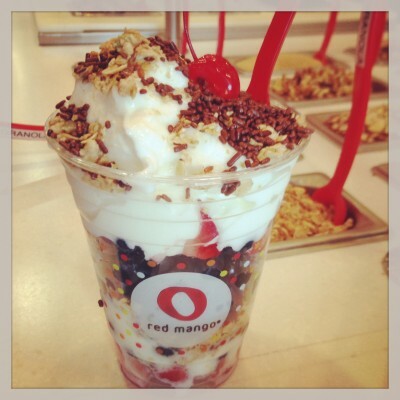 I spent the 10% of energy I saved on perfecting my Saturday parfait at Red Mango. You know you are the Queen of Parfait making when the staff as well as other patrons comment on your creation. The bottom is always strawberries. Finished off with more granola and chocolate chips or lately, for a bit of fun, chocolate sprinkles. There is something fun about adding a few sprinkles. I like how they spread themselves evenly throughout the yogurt so you get a taste with each bite. I love that this sweet treat of mine is actually rather healthy. Speaking of sweet treat, I coined a new term Saturday night: Double Dessert Happiness. 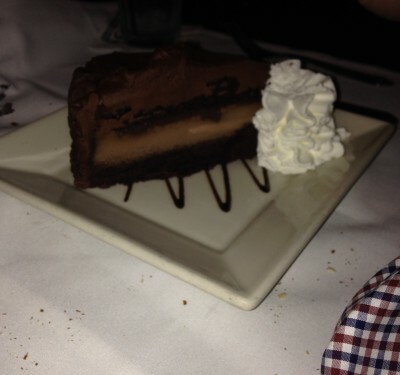 This hunk of fudgy Linda’s Fudge Cake from The Cheesecake Factory is incredible on its own but is made all the more sweeter when the person you are with orders their own chocolate dessert and welcomes your spoon on their plate. Linda’s Fudge Cake + Hershey Bar Cheesecake + Your Spoon Having Freedom To Roam = Double Dessert Happiness. 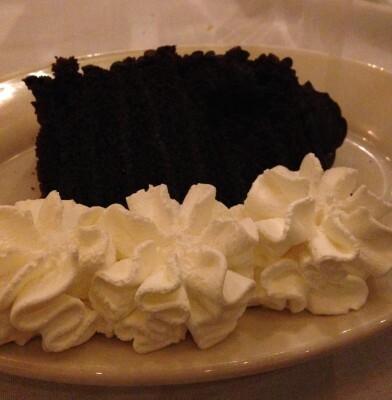 Do you eat your cake with a spoon or a fork? In my opinion, all dessert should be eaten with a spoon. A little spoon. It doesn’t take much to please me. Just remember to feed me chocolate cake and I will be smiling. So it is Monday morning again. A chilly Monday morning that is. I don’t think I will be bundling up for a run though since I am due for a cross training day in the gym. I ended up running a few slow and easy miles yesterday morning and since I am trying to not run more than 3 days in a row, I will force myself inside. On tap for tomorrow: Tips on getting the winter workout gear you want at discount prices. Did you collect stickers as a kid? Collect anything now that you didn’t know you were collecting? Do you eat your cake with a spoon? Haha I’m the same way with lipbalm and samples of makeup. I have TONS of samples! I’m thinking about putting them into little kits and giving them out at Christmas! That is a great idea! I have a ton of those samples too – stashed in another bag in the bathroom cabinet.